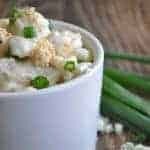 Blue Cheese Hominy is the ultimate in comfort food! Creamy, cheesy hominy makes the perfect side dish to any meal! Once the butter is melted stir in the flour stirring constantly until combined keeping the burner on low heat. This will create a thick paste. Continue stirring for 3 minutes. Add in the half and half, whisking to combine, increase to medium heat. Stir frequently for 4-5 minutes until thick. Add in the cheese slowly while stirring. Reduce to low heat. Stir until the cheese is melted. Add the hominy into the saucepan to mix with the sauce. Transfer to quart size baking dish. Cover with foil and bake at 350 for 30 minutes. Remove the foil and continue baking for an additional 10 minutes.